My Craftsy Pattern Shop is Open! Craftsy allows pattern designers to upload and sell their patterns from a personalized pattern shop for free! These are downloadable patterns so you once you buy them, you can instantly download them and get to creating! Craftsy is a really great company. In addition to taking tons of classes, I love the fabric they offer! The pattern shops are just another great service this company is doing for the art and craft community. Check out the Crafty Cat Studio pattern shop or view the "My Patterns on Craftsy" widget in the right side bar to see what I've got for sale right now. This pattern has been my top seller! It's a clever bag design that is made with two fat quarters. It's fun to make and a beginner friendly pattern. Make one for yourself or as a gift! My local guild has made and sold these for their fair booth two years in a row so far and they sell out quickly. I love seeing my designs enjoyed by so many people! A versatile and functional card holder design. Make one to hold your business cards, shopping cards, or coupons. This pattern was created because I needed a card holder for my business cards. I wanted something compact, it finishes at 4" x 2" folded, and quick to make. I also love it if I can use up scraps on small projects like this so this pattern is very scrap friendly! I also made it compatible with the AccuQuilt GO! fabric cutting system, but the instructions for traditional rotary cutting are included as well. I needed a baby blanket for a friend's first baby and I love tumblers so this pattern was born. I picked out some really cute baby fabric and set out playing with layouts. This blanket works well in the crib or on the child's first bed. I wanted it to be big enough so it could be used for awhile but also cuddly and easy to clean. I kept the quilting simple and used flannel on the back! The finished size is 43" x 49". This is also an AccuQuilt GO! friendly pattern, but I also include a template for the tumbler shape so you can make it without the special cutting system. Add a bit of fun to any room with these cute cats adorning your wall or table! Save your furniture from the pet hair or fill it with catnip for a fun toy. Make one for your child to cuddle with. Its small size means you can take it anywhere! This pattern was a bit of fun I decided to make for my cats. They were needing new blankets and I wanted to make something that was a bit more interesting than the usual square. I started playing with abstract cat shapes and ended up with this fun pattern. I liked it so much when I was done that it ended up on my dining room table as a table topper instead of as the cats' new blanket. I ended up making a few more so my cats could each have one too. This is also an AccuQuilt GO! friendly pattern and the rotary instructions are included as well. Now that I'm done with these rereleases, I can get back to my new patterns. I have several new patterns in various stages of completion and I'll let you know when they are ready for you to enjoy! So keep any eye on my blog! * Crafty Cat Studio is an affiliate of Craftsy. If you click on the provided links and purchasing an item, Crafty Cat Studio will receive an affiliate commission. However, I only recommend products and services I use personally and believe will add value to you, my readers. So I disappeared for a bit. I've been super busy with the stuff behind the scenes on this site and with starting this new business. All the fun stuff, like making a new pattern template and learning which plugins I need for my site. Lots of researching and designing time. Things are starting to get settled so I should be able to start posting more. In addition to my business startup work, I've also been helping my Mom with her entry in the AccuQuilt Block Design Contest. 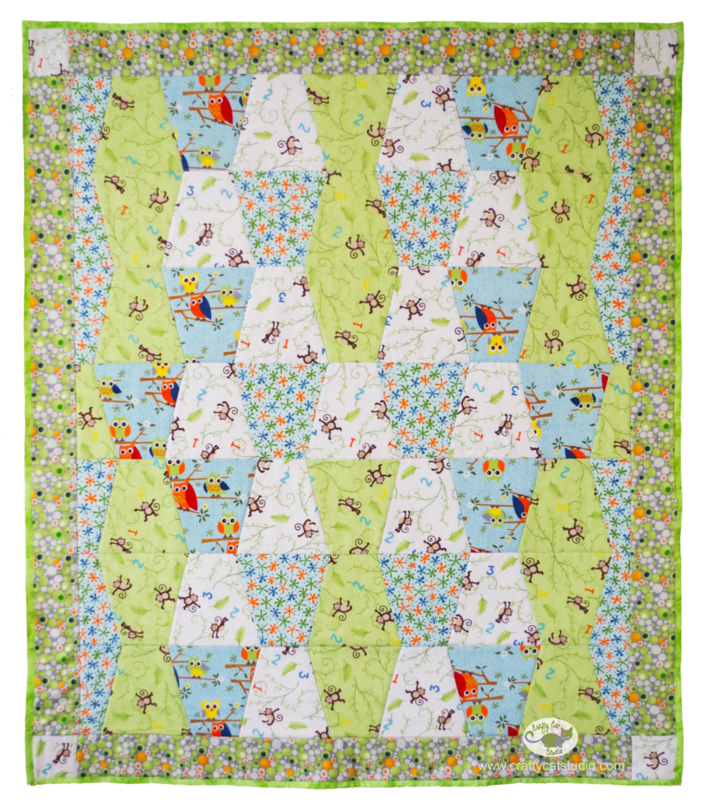 My Mom, Julie Wilcox, entered her block design called Tribute into the AccuQuilt Win the Dream Quilt Block Design Contest! She made the block in honor of my grandfather who was in the Navy for 23 years and currently has dementia. If she wins, the Valley Quilter's Guild (our local guild) and the national charity Quilts of Valor will win too! 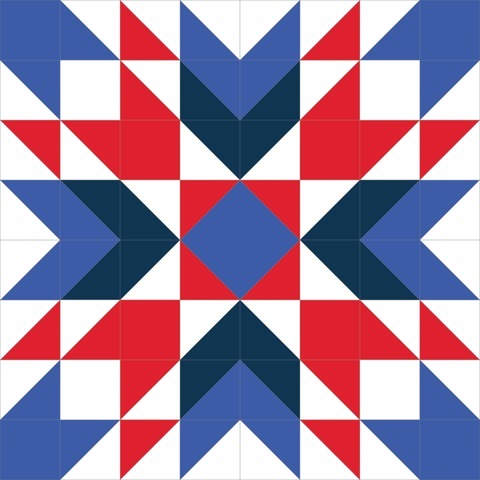 For those unfamiliar with the Quilts of Valor, they are a national charity that gives Quilts of Valor to service members and veterans that have been touched by war. To date, they have given 99,577 quilts! They are a wonderful organization that gives back to the people who defend our way of life and that's why we want to help them. Our local guild will win an AccuQuilt Studio fabric cutter and a collection of dies. This will help so much with all the cutting that needs to be done for all the Service quilts that are made for our local charities. Also, just having access to the Studio during Open Sew days will be a great benefit to the members. To win the Block Design Contest, Tribute has to have the most votes by May 27th. Everyone can vote one time each day between May 1- May 27th and each vote enters you in the daily prize giveaway which is worth up to $700! In the last few days, her block has managed to climb up to page 1 (14th place) which is fantastic, but we have to keep the momentum going. A month is a long time for daily voting, but it's worth it if we can win a donation for Quilts of Valor and our local guild, Valley Quilters Guild. Plus the daily prizes are pretty awesome too! When the contest is over, my Mom and I will be making a quilt with this block to send to my grandfather. I'll be sure to share pictures on here. The AccuQuilt contest ended....and Tribute didn't win. We got all the way up to 12th place on our best days last week and then we got knocked down to 17th. We bounced between 16th and 17th but in the end 17th was where we ended. It was a great effort by everyone and I really want to say THANK YOU sooooo much! We ended up with 860+ votes which is just amazing and so humbling! Crafty Cat Studio's Website is Live! My new site is finally live! I've been itching to share this project with everyone, but I wanted the site live before I gave out too many details. This is my new home online where I'll be talking about my creative adventures, sharing quilting/crafting/art related ramblings, and showing my latest projects. Crafty Cat Studio is named after the constant companions I have with me in my studio, Kally and Wesley. Sometimes helpful, sometimes just in the way, my cats are always with me. Unless the iron is on or paint is out, then for their own safety they are shut out for a little bit of time, but even then they aren't far (usually yowling at my door). I've been doing art my whole life (drawing, painting, sculpture, design, knitting, sewing, etc.) and it's amazing how unhappy I get when I can't create. I spent the beginning of my career in the technology field. It was fun and rewarding but I really didn't get to be creative. I'd try to find time to be creative away from work, but mostly I only had time for the endless cycle of sleep and work. When I was getting really worn out by this cycle and itching for something new, I discovered quilting. I really loved how you could make this craft your own. The more I got into this craft, the more I learned how it could become a full time career. I decided to break out of the sleep/work cycle and forge my own path as an artist with the invaluable support of my family. I started out working with my mom, Julie, on Sew Many Blocks. We have written several best selling patterns and I learned a lot about running my own business. You can find her patterns in her Craftsy's Pattern Shop. I'll be opening my pattern shop soon, so keep an eye on this blog. I'm really happy I made this career change and I'm looking forward to each new challenge and that's where Crafty Cat Studio comes in. Recently I wanted to shift focus a little and spend some time working on art quilting along with the pattern writing. I also thought it would be fun to have a blog to go with this adventure since I'll be experimenting with a lot of new tools and techniques plus mixing in stuff from my extensive art background. These ideas became Crafty Cat Studio!